Digital cameras are great value for money these days. Rugged, colorful designs, with easy to use controls, are ideal for kids to play with. Kids are natural mimics, they love to play at "grown ups" and imitate the actions of their parents and other adults. Digital photography is a great way for them to do this, whilst letting their creativity of the leash at the same time. There are plenty of digital cameras specifically designed for younger children available these days. If you choose the right one, your children will have huge amounts of fun - and so will you! Photography - taking pictures - is a great pastime for young children. It lets them play at grown ups, be creative and explore the world they live in. It also helps with spatial awareness and perspective. In short, it is a fun and educational activity for young kids - and it's a hobby which most will retain through to adulthood. It's a great activity for all sorts of reasons, and one which should be positively encouraged. I'm old enough to remember when Polaroid cameras were considered new and exciting. They had been around for many years - but they first hit the domestic market in the late 60's and early 70's. It was great that you didn't have to wait for your snapshots to come back from the lab. Huddling around the little square photos and watching them turn from black to grey - and then to a recognizable photograph - was an exciting experience (we didn't have games consoles or the internet in those days). Of course, these days, even a Polaroid is too slow. For all but the most specialized photographers, cameras are digital these days. You can review your photos immediately on a small LCD screen, and have larger versions of your best photos on display on a computer screen, a digital photo frame, or even the family TV, within a matter of minutes. Apart from the immediate results, there are no reels of film to buy, load and send off to the lab. That makes digital photography a lot cheaper (and more environmentally friendly into the bargain). Neither do you have to worry about running out of frames at the end of a reel - usually just when something interesting is about to happen. It's a liberating experience. You can experiment as much as you like - and take as many photos as you want. The only limit is digital memory - but the SD cards that usually store digital pictures are very cheap these days, so that shouldn't be a problem. Take lots of photos, keep the ones you like, delete the rest. For that matter, you can even keep the bad ones - just in case. Just load them from your camera to your computer, or a flash drive and you'll be ready to go and take as many new photos as you like. As far as young children are concerned, digital photography is, for all of the reasons listed above, a fantastic development. 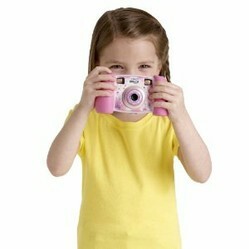 Choose the right digital camera for your children and they will have hours of fun - and it won't cost the earth either. 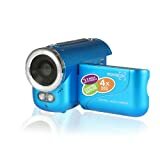 If you're looking for the best kid's digital cameras, then there are a few things that you need to consider. Often, there isn't a right or a wrong answer - much will depend upon the age and personality of the child who the gift is intended for. However, if you work through the checklist below, you should make a good choice. Choose a camera with easy to use controls which are clearly marked and well laid out. Little hands and fingers will struggle with small, fiddly buttons. Ease of use will hugely enhance children's enjoyment. Choose a camera that is sturdy enough to put up with a few bumps and scrapes. Kids play rough sometimes, and you can't expect a 3 year old to mollycoddle their camera. There are plenty of rugged designs available for younger children which are tough enough to stand up to a little mishandling. Choose a camera that makes it easy to get the photos on display. Kids will love to see the fruits of their labor on a larger screen. Make sure that the transfer from camera to computer/photo frame/TV is fast and easy. Choose a camera with some simple special effects software included. Kids will love to add special effects - borders, cartoon effects, etc. - to their photos. Hi Cmoneyspinner - Never thought about it like that - but you're right! Awesome!!! I love toys that encourage young children to develop a useful skill that could turn into a means of income for them later on in life.